Our Valley finally began its annual cooling trend last week. After several months of nearly 100 degree heat, we were able to enjoy a rainstorm, complete with chilly temperatures and a delightful nip in the air. Along with those blissful breezes come the sniffles and sneezes… when we start to feel like we’re running down, I like to put a pot of this luscious soup on to simmer. 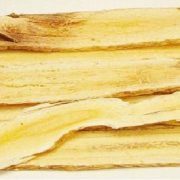 It does a wonderful job of soothing sore throats, boosting immunity, and calming that strange feeling of general malaise. When most people think of boosting their immunity naturally, they think of elderberry, ginger, garlic, or even honey. 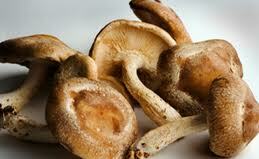 However, mushrooms are wonderful immune boosters! They are anti-viral, antioxidant, and have some research supporting them as a cancer preventative. When I first learned about mushrooms having health benefits, I took one look at those sad packages of white button mushrooms and laughed. They didn’t seem like they’d be good for much of anything – let alone keeping me healthy! And that’s true. Those white button mushrooms really aren’t great for boosting immunity. Just like many of the foods we eat, the more processed and packaged they are, the less likely they’ll be good for us! One of the best edible medicinal mushrooms is shiitake. Eating shiitake mushrooms regularly may effectively strengthen your immune system. Shiitake mushrooms contain a powerful compound called lentinan, which enables your immune system to fight diseases and infections more efficiently. In fact, shiitake mushrooms are believed to be more effective than many prescription drugs. Shiitake mushrooms can help you battle more common infections like influenza to more serious health ailments like HIV. Using homemade chicken stock in your soups is a great way to guarantee powerful nutrition for your body. I like to use my Immune Boosting Stock when I’m making this soup. It’s a great way to combine healing herbs with the soothing elements of stock. Sage and thyme are two of my favorite herbs to add to soups during this cool season. Thyme enhances the ability of the lungs to strengthen and fight off inflammation, while sage is a powerful diuretic and expectorant, helping to clear nasal and chest congestion quickly. Heat oil or butter in a large saucepan over medium heat. Add the onion, garlic, and mushrooms, stirring occasionally for 7 minutes, or until very soft. Add the red wine vinegar and cook for 2 minutes. Sprinkle with flour and continue cooking, stirring constantly for 3 minutes. Gradually add the stock and simmer, stirring occasionally, for 5 minutes, or until the soup thickens slightly. Add the optional sour cream, sage, thyme, and paprika. Cook, stirring occasionally for 3 minutes or until heated through. If you cannot find shiitake or porcini mushrooms to use in this recipe, brown crimini mushrooms can be substituted, as well as combining some shiitake and crimini. Please make an effort to buy organic mushrooms, or even better, locally grown. Conventional mushrooms are frequently treated with fungicides (ironic, I know). Do you use mushrooms for their immune boosting properties? What are other ways you increase your resistance to illness during this cooling season? Thank you for this timely and delicious recipe. My adult son has recently been diagnosed with psoriasis and has chosen to begin taking methotrexate. I am so concerned about this drug’s toxicity and side effects, and am doing all I can to support him with nutrition. I am grateful for your site’s help in this area. @Shyla, Thank you. What a powerful drug! There are so many natural remedies for psoriasis – God bless you in your search! Mmm…I LOVE mushrooms and especially in soup. I can’t wait to try this! That’s great to know that mushrooms are immunity boosters. And when paired with the chicken stock in this soup – wow! I’ll have to keep this dish in our soup rotation this fall/winter season. 🙂 Thanks for sharing, Meg. I started with the tiny little gourmet mushrooms, and loved them! I just worked my way up the size chart. 😉 Now I can totally handle them. I love mushrooms, and hate being sick. This recipe = win for me. Whew. I wish I could eat them. I have issues with certain mushrooms. Sometimes the texture just does me in. 🙂 But, they are very pretty to look at! This sounds and looks great! 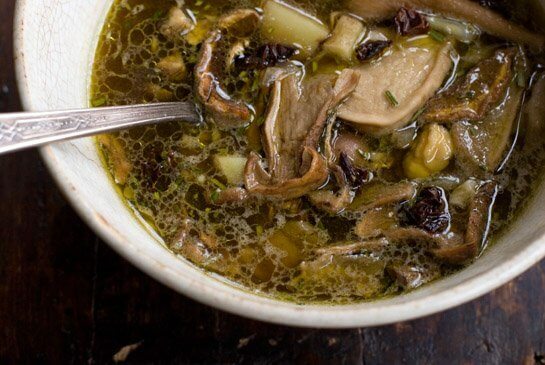 I’ve been thinking of ways to turn homemade broth into a good immune booster for this winter. Sage is a powerful and effective herb, but pregnant and nursing women should avoid it since it can dry up your milk supply. @Deborah, You’re right – I forgot to add that in. Thanks! What a great recipe. I just went to a health fair today and Dole was there passing out samples of their new mushroom powder. Saying how it has loads of vitamin D, and that it can be mixed into things like smoothies. However, I think I would rather this mushroom soup. This looks fantastic, and another good way to get homemade stock into my family. Seems like I remember reading that sage in large quantities can interfere with lactation? Do you know anything about that one? @danielle, Yes, sage does affect lactation. However, I don’t eat this soup every day when I’m nursing, and I didn’t notice a difference in my milk supply (and I’m very sensitive). 🙂 You can always add more thyme, or substitute parsley, which is also a great tasting herb with medicinal benefits. I am curious about your statement on eating organic mushrooms and them being treated. mushrooms for the first time made the list of safe top 12 foods this year to eat non organic. @kelly, I am using information I heard/received a while ago about the fungicide treatment of conventional mushrooms. I don’t remember the exact source, but I spoke with our local mushroom producer and she confirmed that many conventional producers will use a fungicide, or similar chemical to prevent mold for long-term storage & shipping. My (updated) Clean 15 checklist from EWG doesn’t list mushrooms in their safe list, though, so we will continue to buy organic vs. conventional. We prioritize local and organic foods, and are incredibly blessed to have a source for local, organic mushrooms. Use what you can find. 🙂 Whole foods, conventional or not, are always best. We just made this for dinner. It was wonderful. Was so tasty. Thank you. We added a little bit of feta before we served it this made it even yummier. Meg, this soup looks delicious! My family loves mushrooms! My hubby likes to have meat with most meals, but I think he would enjoy this meatless soup! I didn’t realize mushrooms were so good for immunity! I can’t wait to try this out!! Mushrooms are the best veggies ever. that dont taste like nothing before you cook them. but after you cook\steam them, it the best. Adding chicken sounds like a wonderful idea! I think I’ll make this as a blended cream soup (sour cream? cream from raw milk? greek yogurt?) with croutons for those in my family who would never eat mushrooms. 🙂 Thanks for the very yummy recipe! If I was to use dry sage and thyme then how much would I be using ? This time of year we can use all the help we can get when it comes to boosing immunity. I can’t wait to share this with my husband as he loves mushrooms! I just starting eating shiitake mushrooms and love them. I do though like baby white button mushrooms; the ones I have gotten have alot of flavor. I am going to try this recipe adding some cream too. I have trouble drinking milk, but can eat in in soups most of the time. Shiitakes are my favorite. Are all shiitake you get at the grocery store, sprayed with fungicide? I don’t know where else to buy them? They taste sooooo good. Thanks for the tip on sage and thyme. Another tip I found, was how to store your mushrooms. Store them in a brown paper bag, not a plastic bag. I have found it keeps them dry and fresh. Have a nice, and blessed day.